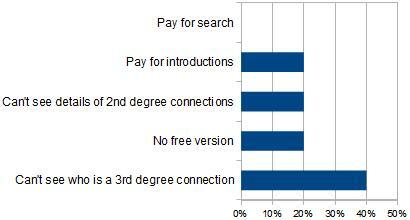 But for all the disagreement over what will change, nobody seems to think that free search will go away. I mean other than having to pay for the nifty new search features, and not seeing much of any 3rd degree details unless you pay – it seems likely that you’ll still be able to drop some keywords in and get results. Your answers were across the board. What’s most likely LinkedIn’s next big change? While all of these equally awful options has some support, if you believe the pollsters, the more likely option is that free viewers will just stop seeing 3rd degree connections all together. Next up – Pick a Number! Ok – I have a long-standing theory about picking numbers. I’m fairly confident that I can guess what number you will pick when I ask you to pick a number from one to four. In person I’ve got a nearly 80% success rate. What if they reduced the number of “free” invitations from 3,000 to 1,000 and then you had to pay for batches of 100 after that? What if they reduced the number of “free” connections from 30,000 to 1,000 and you had to pay after that? What if they reduced the number of “free” groups from 50 (plus subgroups) to 15 and you had to pay after that? They can’t alienate the rank and file members who provide the fodder for the recruiting engine. So groups are probably safe. Interesting ideas – one issue though, LinkedIn has never embraced the indiscriminate connectors that try to build large networks. If they were to make people pay for the ability to connect or have large numbers of connections, those people could arguably make demands for actual services. My current hunch is that LinkedIn makes it as awkward as they can for people that massively connect or invite – as a means of limiting that behavior.